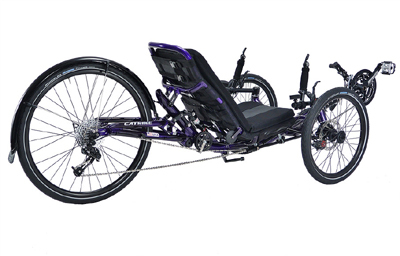 The Catrike Trail is a folding casual trike with a sporty edge. 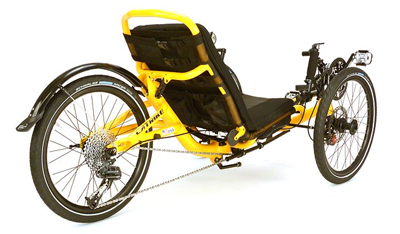 US-built with a wide choice of colors and Catrike’s value packed spec. 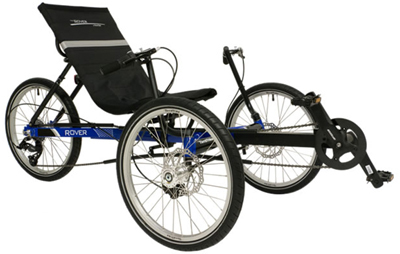 The new 3nd edition Trail is Catrike’s original folding model. It also has a higher, adjustable seat, but eases it a little lower and laid-back, reclining 45-51°. Compared to other Cats it is compact for tight turns. The 20 inch drive wheel is better suited for loaded touring or casual riding and isn’t for those pushing for the highest speeds. 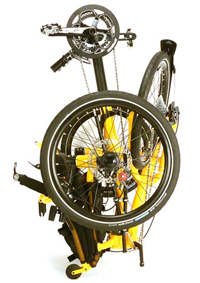 The Trail is a fast and compact folding trike with integrated dolly wheels to help you move it in the folded position. The seat back folds forward and the rear section tucks up under the frame. We’re calling the Trail a casual trike, but in truth it is a bit zippier than what we’d typically consider one of those. Having come up with this easy classification system we then start running into items that defy the system. Oh well.